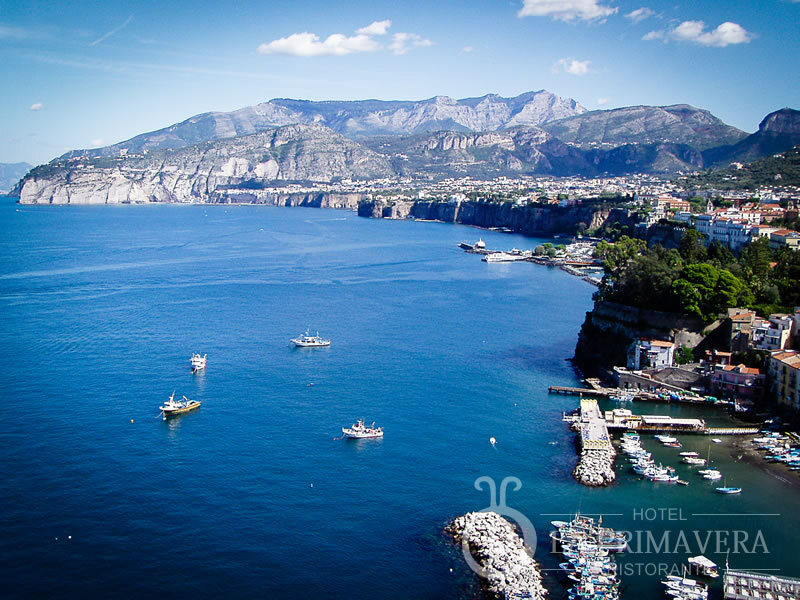 Sorrento is built upon grey tufa rock, but is surrounded by the white limestone of the hills, with the prevalent green of the olive groves and the yellow and orange of the citrus groves. The origins of Sorrento are not known with certainty, although its ancient name “Surrentum” is perhaps connected with the myth of Homer’s Sirens. We know that it has been inhabited and colonised since prehistoric times from an Oscan inscription by Italic inhabitants discovered at Punta della Campanella. The town’s urban layout, divided into insulae, with intersecting streets (decumanum and cardum), recalls the Greek plan of Hippodamus of Miletus. Some inconsistencies with the classic scheme devised by Hippodamus suggest, however, that the town layout may have been designed by Roman hands. The remains of Roman villas scattered along the coast, the numerous archaeological finds in the museums and continuously coming to light, indicate that Surrentum was a privileged dwelling place for the Roman aristocracy. This is amply confirmed by the writings of Statius and the great encyclopaedia of antiquity, “Naturalias Istoria”, in which Pliny praises the quality of its wine. Following the decline of the Roman standard, the land that was later to become the birthplace of the supreme poet, Torquato Tasso, in 1544, was formally administered by the Emperor of Byzantium, while still preserving a certain autonomy as the Duchy of Sorrento, which extended from the Samo to Punta Campanella.